154 Hidden Court: Chore tracking, techie style. 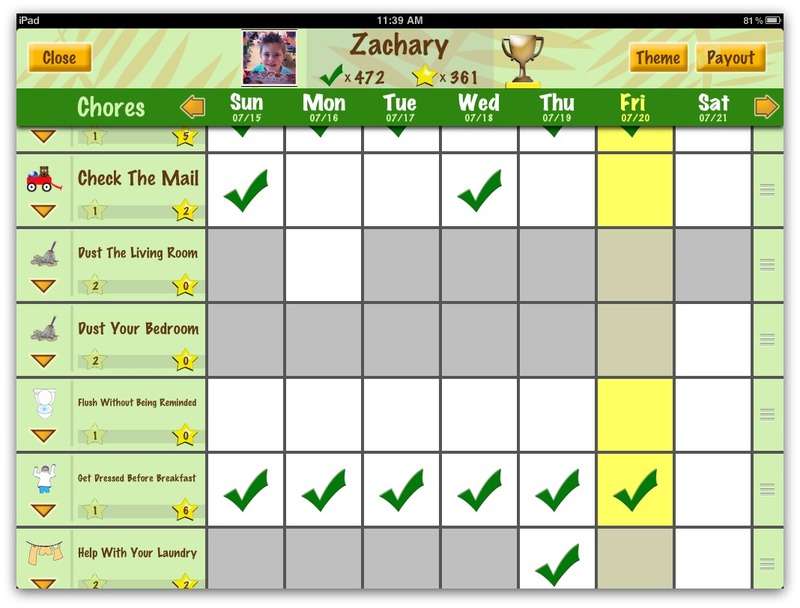 When we were approaching the end of the school year last year, I knew that I wanted to put a formal chore chart into place for zj over the summer. 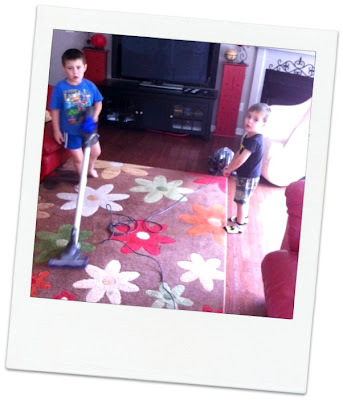 He's always been expected to pick up his toys and keep his room neat and such, but I really wanted to take it up a notch because I didn't want to spend the entire summer picking up his crap. I looked to Pinterest for some easy DIY chore chart ideas, but then as I was measuring and planning dimensions and deciding on materials I thought "Hey, there should be an app for this." And guess what? There was. 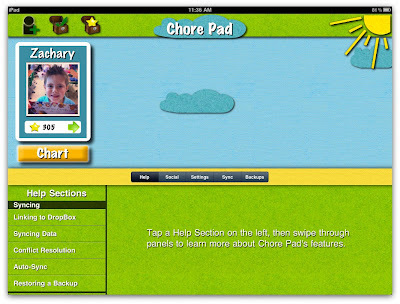 I looked at several iPad apps before I decided on ChorePad. I liked this one and even though I had NEVER paid $4.99 for an app before, I bit the bullet and went for it. Actually, I don't believe I had ever even paid for an app before. I lean toward free. Always. to do when zj goes back to school in a few weeks. I liked that it was easy to use, to customize, and to update. we need to work on our flushing skills. Clearly. Here's how it works. 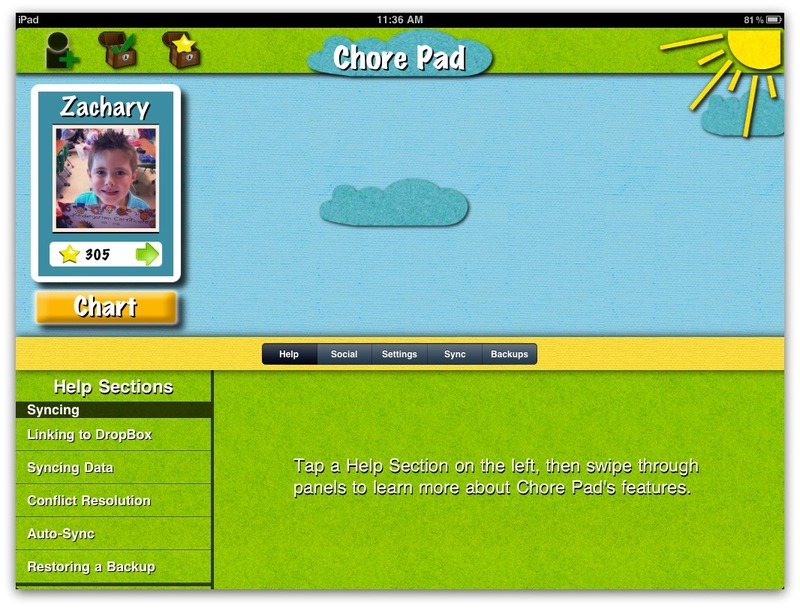 You create a chart for your kid, then assign him or her specific chores. 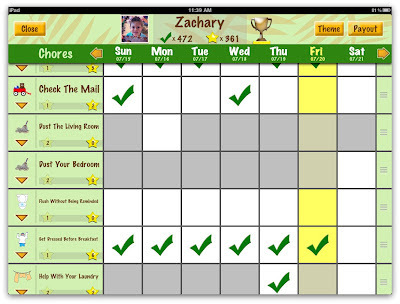 The chores can be for every day of the week or only for specific days. Then, each chore is assigned a star value. For example, in our house, checking the mail is worth one star and dusting a room is worth two stars. Then... and here's the fun part, you can assign rewards, or payouts, that the kid can spend his stars on. You get to choose how many stars each reward will cost. Our rewards are things like staying up one hour past bedtime, or a prize from our prize box, or a trip to the Dollar Tree with $5 to spend. However, since zj is a tightwad of the most insane kind, he has yet to actually SPEND any stars, preferring to collect them and count them and talk about how many he has. I can only assume he's saving up for the Rolex, or maybe the trip to Tahiti. Scrooge McDuck, anyone? Zj has really done well with it, but like any reward-based program, it's only really effective if you keep up with it and talk about it all the freakin' time. "Zj, thanks for getting the mail! That's one star! Hey, great job picking up the toys before dinner! You just got a star!" and so on and forever. My biggest accomplishment this summer has been teaching him to do his own laundry. I say, "Hey, it's laundry day!" and he can bring it downstairs to the laundry room, put it in the washer, measure the detergent, turn it on, move it to the dryer and then take it upstairs and put it away. WITHOUT HELP. Yes, he's six, but I decided that if he has the attention span to attain extremely high levels on Lego Batman and the manual and physical dexterity to climb the highest equipment on the playground that surely he could handle a load of laundry. And guess what? I was right. I think I may be in the parental minority when I say that I think it's important for kids to participate in running the household. Would it be easier to do it myself? Most likely. Is it done the way I would do it? Definitely not. But my feeling is that kids need to know about what it takes to make house, and therefore a family, run smoothly. There is no underwear fairy who deposits clean underwear in your drawer while you sleep, contrary to popular belief. So yeah, I'm going to call project ChorePad a success. Now if I could just teach them to mix me a good Bloody Mary. They never use enough Tabasco. Note: This is not a sponsored post. The ChorePad people, wonderful though they might be, have never heard of me. However, if they stumble across this post and want to reimburse my $4.99, I would not be opposed. I'm still a little bitter about that part.